Make the solar switch and you can save 40 to 80% of the cost it takes to heat the water in your property. In 2015 our company was named the #2 Solar Water Heating Contractors in all of Florida by Solar Power World. Solar hot water systems are a phenomenal investment for many businesses. Electricity costs for hot water heating in commercial buildings add up. In the hotel industry, most energy consumption comes just from producing hot water! Reduced energy costs are just one of the reasons organizations across the country are realizing the potential of solar water heating. Why Choose Solar Hot Water Heating? Cost-effective. Solar water heaters are the most cost-effective way to generate hot water for your business year-round and can save you thousands of dollars. Return on investment. Installing solar in your building is one of the safest investments you can make. The system pays for itself within 3 to 5 years and they’re built to last for 30 years or more. Clean energy. Traditional electric water heaters emit two tons of CO2 into the atmosphere on average. Solar water heaters use clean power and produce no greenhouse gas emissions. Tax credit. Solar water heaters qualify for a 30% Renewable Energy Federal Tax Credit from the government, accelerated depreciation and some local utility rebates. Be green. Get your business involved in the green energy movement. Switching to a solar hot water heater is the perfect first step toward a greener company. The way in which solar hot water systems, or solar thermal systems, operate is simple: Solar panels are heated from the sun and water that runs through them also gets heated. The heated water is then ready for use. 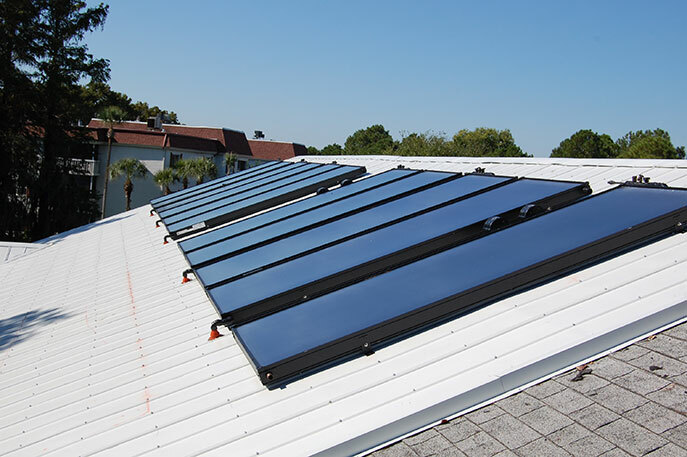 The two types of solar water heating systems are active systems and passive systems. Active Systems - An active solar hot water system uses a pump that circulates water through the system. Active hot water systems reduce water heating costs by up to 80%. There are two types of active systems: direct circulation (open loop) and indirect circulation (closed loop). Passive Systems - The passive solar hot water heating system does not use a pump and instead relies on convection to move water through the system. They have the fastest payback of solar thermal systems (usually 3 to 5 years) and are less expensive to install than active systems. While they are not usually as efficient as active systems, they can be more reliable and longer-lasting. They will not reduce water heating costs as much as active systems, but they will reduce water heating by up to 75%. There are also two types of passive systems: integral collector (storage passage) and thermosiphon. "Superior Solar are one of the most professional companies I have dealt with. From the estimate thru installation to after sales they have been superb. I would recommend them to anyone"